Cyprus 1974: “This Ain’t No Picnic, It’s War” is the edited personal diary of Alain Gaudet, a twenty-two-year-old paratrooper with the Canadian Forces in a peacekeeping role in Nicosia, Cyprus. The diary is a fascinating look at daily life from the soldier’s viewpoint. It gives the reader insight into the challenges and frustrations of a solider in combat, how he deals with the loss of friends and compatriots, and the extremes of emotions on display in a war zone. 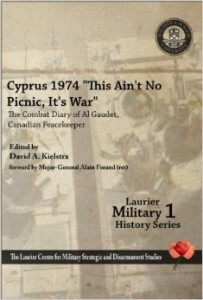 This series of military history booklets, published by the Laurier Centre for Military Strategic and Disarmament Studies, will include edited diaries and memoirs, reports created during wars involving Canadian Forces, as well as shorter original monographs. We hope to provide a new opportunity for graduate students and faculty to publish works of greater than article length in a peer-reviewed series which will be attractively designed and reasonably priced.